Vero Software, a leading provider of CAD/CAM/CAE solutions for the tooling industry, are pleased to announce the release of Machining STRATEGIST V14. A powerful multi-axis CAM solution that generates optimum High Speed CNC toolpaths for both the office and shop-floor environment. Machining STRATEGIST is a CAD independent solution and can work with data from all major 3D modelling systems. Within the latest release, support for VISI 20 has been added and the CAD interfaces have been aligned to Parasolid v25. Significant product enhancements include a new innovative Roughing algorithm that will greatly benefit both Machining STRATEGIST customers and OEM partners. The new roughing strategy massively reduces rapid moments by controlling the tool movement so that it remains on the part, following previous cut paths instead of rapid feeding to the new position. 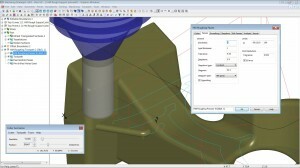 Additional toolpath optimisation features include the ability to automatically machine flat areas only instead of adding extra Z levels to clean up planar zones. The new roughing algorithm also permits to the use of a large step over (greater than 50%), where an innovative offset algorithm ensures total coverage of the machining area by adding smooth transition corner pips to clean up any remaining areas. Improvements to linking core area clearance toolpaths. Linking horizontal area passes from outside to in (core linking). Use pre-drilled entry points for cavity regions of core roughing toolpaths. Minimise retract moves on vertical walls. More consistent lead arcs when linking.